The What: Lectrosonics is now shipping the DBa digital belt pack transmitter as part of the DSW (Digital Secure Wireless) microphone system. Featuring 24-bit/48kHz digital audio for optimal sound quality, the DBa is designed for use in theaters, filmmaking, touring, and other demanding applications. The What Else: The DBa features wideband tuning (470-698MHz), a highly linear RF output stage for reduced intermodulation distortion, and a true 50mW transmission RF power for high range and resistance to dropouts. The TA5M mic/line input found on the DBa digital wireless belt pack transmitter accepts all lavalier and head-worn microphones wired for Lectrosonics servo-input transmitters. The transmitter has an audio frequency response of 20Hz to 20kHz, +/- 1dB. Its system latency is 2.5ms, and it has a distortion of 0.05 percent THD+N, 1kHz at -10 dBFS. Its dynamic range is 108dB A-wtd. The DBa uses two AA batteries for a 5-plus-hour (alkaline) or 9-plus-hour (lithium) run time. The Bottom Line: The DBa’s compact and lightweight but rugged machined metal construction add durability for tough environments, and its AES-256-CTR (Advanced Encryption Standard) encryption technology makes it well suited for use where privacy is of paramount concern, such as corporate boardrooms, shareholder meetings, and government facilities. 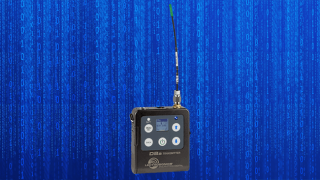 The DBa digital belt pack transmitter is available now, with an MSRP of $2,150 U.S.